This volume includes expanded versions of the lectures delivered in the Graduate Minicourse portion of the 2013 Park City Mathematics Institute session on Geometric Analysis. 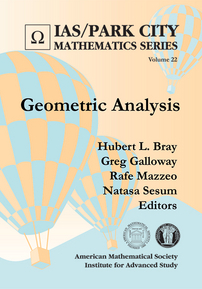 The papers give excellent high-level introductions, suitable for graduate students wishing to enter the field and experienced researchers alike, to a range of the most important areas of geometric analysis. These include: the general issue of geometric evolution, with more detailed lectures on Ricci flow and Kähler-Ricci flow, new progress on the analytic aspects of the Willmore equation as well as an introduction to the recent proof of the Willmore conjecture and new directions in min-max theory for geometric variational problems, the current state of the art regarding minimal surfaces in \(R^3\), the role of critical metrics in Riemannian geometry, and the modern perspective on the study of eigenfunctions and eigenvalues for Laplace–Beltrami operators. Graduate students and research mathematicians interested in important topics in geometric analysis. It is a fascinating panorama of this highly active and deeply connected subject.